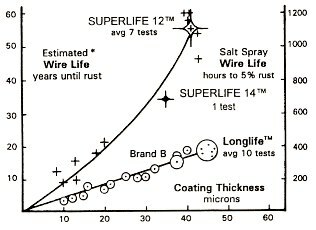 Tests in the USA, Europe, and Japan showed that the Superlife Wire coating lasts three to five times longer in corrosive salt and chemical sprays (similar to herbicides, pesticides, etc.). Unlike aluminum coatings, zinc coated wire's sacrificial behavior means that bare spots on the wire from scratches will not corrode for a long distance away from the undamaged coating. The New Longlife Plus™ wire has the heaviest zinc coating available. It has 50% more than class 3, is currently a lower cost alternative to Superlife, and will perform between the two lines on the graph shown here. MAXIMUM STRENGTH WITH KNOTABILITY - for easy construction of all weights and styles of high tensile wire fences. - when used for trellising crops where sprays are used and vegetation traps moisture on wire. *Wire life estimate is for a humid environment without other corrosive chemicals (it will last much longer in a dry climate) and only about half as long in coastal and industrial environments and when exposed to corrosive sprays and chemicals. MAX-FLEX wires all have heavy class 3 or 4 type coatings with a minimum of 0.8 to 1.2 ounces per square foot of wire surface which equals about 40-60 microns of thickness on the graph above. 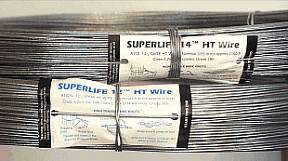 There are no comparable products to MAX-FLEX Longlife Plus and Superlife Wires in the American fence wire market..